There are certain Survivor traditions that we know are coming every year, from the obvious (the merge) to the not so obvious (the visit-from-the-loved-ones episode). This week’s episode brought my least favorite of all the traditions: the Survivor auction. But you know what? I actually enjoyed this installment quite a bit. Jeff Probst, who is an executive producer on the show, has been making subtle changes for a while now (it’s probably not all Probst, but as the figurehead and public face of the show, he can stand in for “The Man” behind it). I usually don’t appreciate them, but this new, intricate, almost mean Survivor auction is one of the best. When the tradition started (was it Season 1? I can’t even remember back that far), it was just a simple auction where you could bid on food, or hidden things that were often dirty water. It was pretty straightforward. Now, this thing is like a minefield. Every dish isn’t just a dish, it is an invitation to disaster. Boy, do I like it. 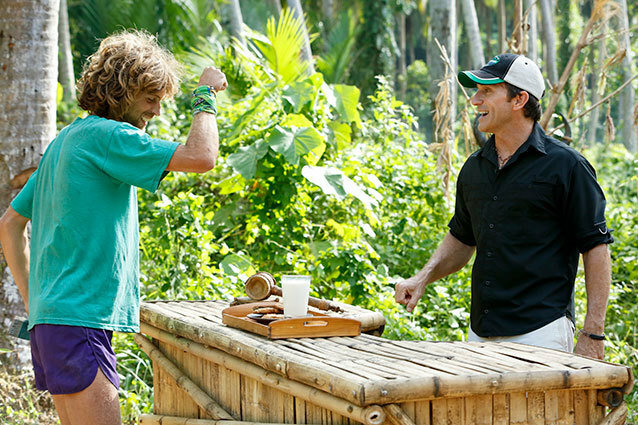 At first, Probst says that whoever offers the first $20 gets beer and nuts; Malcolm claims the prize, even though he was just talking all about how he had to buy the advantage that was sure to be offered. After that, one dish is a Let’s Make a Deal style choice. Then, Andrea is offered the Sophie’s Choice of whether to eat a plate of pasta or take rice and beans for the team, opting for the latter, of course. Malcolm bids his $480 for “information in the game.” This is not the advantage in the immunity challenge (Cochran wins that later, and doesn’t even have to spend all his money to get it), but he does get to read the location of a hidden immunity idol. Zombie Brenda is fretting the whole time of the auction, not wanting to spend all of her money and wind up with something bad. Here’s a strategy tip for you, Brenda. No one ever gets to buy two things. I don’t know why people don’t figure this out. Dawn and Sheri just say, “I’ll give you $500 for a pizza/grilled chicken!” That is how you plays Survivor Auction. You might want to offer $480 now that we know you don’t have to bid on a letter from home anymore and can just buy it with $20. But the point is, saving your money is foolish. Finally, Brenda bids on something and she does get the junky prize. She gets brains. Zombie Brenda is very happy that she gets, brains and eats them with relish. That’s the best way to eat brains. Eddie brings a giant vat of peanut butter. After everyone gets to share it for exactly one minute, the group is allowed to bring back to camp all the PB they are able to spread on their bodies when the minute is up. This is a great idea. Everyone is covered in peanut butter, and they scrape it off their hands and put it in a little container to eat later. Good job, Jeff Probst, on finally making the Survivor Auction something to watch. As I predicted after last week’s absolutely amazing tribal council, Malcolm’s game is good in the short term but not in the long term. We see that again, when he looks for the immunity idol. He goes to look for it, and Andrea c**kblocks him and keeps him from digging for it. She and Malcolm just stand there for hours. She says she was worried that if he found it, she would go home. What Malcolm should do here is root that out of her and use that time standing next to each other to talk to her about the game. Make a final two deal with her right then and there, get your immunity idol and shift the entire dynamic of the game. He does not. At the immunity challenge, Cochran uses the advantage he won in the auction to win the challenge. I have to say, I teared up a little when he won and explained how he came back from being derided for being a sissy, and now he’s won 50 percent of the individual immunity challenges (sure there has only bee four, but). I guess now I have to root for Cochran because Malcolm, my ultimate dream boat, is gone. Malcolm fails to win the idol. Reynold and Eddie both lost the immunity challenge, so they need more coverage. They hatch a plan to get the former Stealth R Us people to split their vote and they would peel off one or two people and add them to their alliance. Both Eric, the zombie, and Sheri, a zombie who is coming to life a bit, seem like they are willing to switch, but they do not. I think that they should have convinced them both that they would be in the majority next week. The only thing that is going to get people away from a majority alliance is thinking that they’re going to be in a new majority alliance where they have a better shot. I didn’t see Malcolm or Eddie or Reynold really making that case, and E & R Music Factory don’t have nearly the strategic play that Malcolm does. They are merely brutes, still in this game because of their strength, not because of their cunning. I must say that both Dawn and Andrea have been playing surprisingly strong games, but other than them and Cochran, who has been smart, but under the radar, we have ended up with a bunch of mediocre people. That’s what happens when you keep voting out the strong. Now there are going to be a few boring weeks as the zombies get picked off on the way to the finale. I can’t foresee a final three with Dawn, Cochran, and Andrea all making it to the end (there will be too many physical challenges between them and the victory) but right now, they seem to be the only ones deserving of having their torch snuffed last.